An asymptomatic carrier (healthy carrier or just carrier) is a person or other animal which has become infected with a pathogen, but who shows no signs or symptoms. Although unaffected by the pathogen themselves, carriers can transmit it to others. 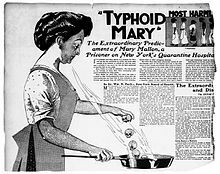 Mary Mallon, known as "Typhoid Mary", was an asymptomatic carrier of Salmonella enterica, the causative agent of typhoid fever. She worked as a cook for several families in New York City at the beginning of the twentieth century and she also cooked for the soldiers. Several cases of typhoid fever in members of those families were traced to her by the Health Department. It appeared that she "carried" the infectious agent without becoming sick. At the time, there was no way of eradicating the disease. ↑ "Dictionary Definition". Medical-dictionary.thefreedictionary.com. Retrieved 20 August 2013. ↑ "Scientists get a handle on what made Typhoid Mary's infectious microbes tick". Med.stanford.edu. Archived from the original on 18 August 2013. Retrieved 20 August 2013. This page was last changed on 10 September 2018, at 07:58.